Pampers diapers are an absolute classic and they managed to build a good reputation over the years. They are even a preferred option in numerous hospitals and baby care facilities around the world. Swaddlers are probably one of their best models because they have plenty of sizes to choose from and the fit is very comfortable. Absorption power is higher than the average. Super soft materials that will not irritate the skin and allow it to breathe. Unrestricted movement for your little one. Not completely eco-friendly since there are some chemicals involved. Leaks might occur often especially if the fit is not good. Why Pampers Swaddlers is a long standing brand you can trust to protect your baby’s bottom. The packaging states that these diapers are chlorine free which is a positive thing. Their products did pass numerous health tests and they will not be harmful to your baby. Pampers also claims that there are no artificial dyes in their products so you don’t have to worry about color transfer from the diapers. Are you looking for an environment-friendly option only? Pampers Swaddlers might not be the perfect solution for you. They do not make a straightforward claim about the chemicals used in their products and the chances are the ingredients might cause some skin irritations, especially if your little one is very sensitive to harsh chemical components. If you are not too concerned about buying green diapers, it is good to know that Pampers Swaddlers are excellent in terms of absorption. But keep in mind that there might be some accidental leaks, especially if you get the wrong sizing and there are visible gaps between your baby and a diaper. These diapers are great overall but they are not completely flawless. …excellent in terms of absorption. We absolutely love the amount of comfort these diapers provide to your little one. They feel incredibly soft on the skin, and the material is very breathable which is a huge plus in terms of comfort. Your baby will not feel stuffy and hot in this diaper, and the side elastic band will provide plenty of freedom for the natural movement. The back elastic is located in the right spot and will keep the diaper in place for hours. There is a tiny downside to these diapers and that is the location of the closing straps. Pampers Swaddlers are positioned more toward the inner part of the diaper, placing the stiff material closer to the baby’s skin. This might be problematic to some infants so make sure you keep a close eye on any possible irritations in that area. …they feel incredibly soft on the skin. Pampers are well known for the absorption and they can hold the liquid for hours while keeping it away from the delicate skin of your infant. He or she will remain dry. They also have the handy wetness indicator, a strip that changes color when baby is too wet. These diapers are available in seven sizes; newborn to size 6. You have to know the weight of your baby before you pick the right size that will be suitable for him or her. Consult the sizing chart located on the box and pick the right diaper accordingly. They should fit well without any visible gaps in order to provide your little one with the best protection possible. The Pampers Swaddlers line does offer another diaper type which is more suitable for sensitive skin prone to rashes and irritations. Unsurprisingly, they are called Swaddlers Sensitive and they are a nice addition because they have aloe vera in them and fewer chemicals. With that said, we have to mention that their absorption power is less potent than the original Swaddlers so there will be frequent leaks. …available in seven sizes; newborn to size 6. Pampers Swaddlers are very simple and you will be able to put the diaper on your baby very quickly. The same goes for taking it off. 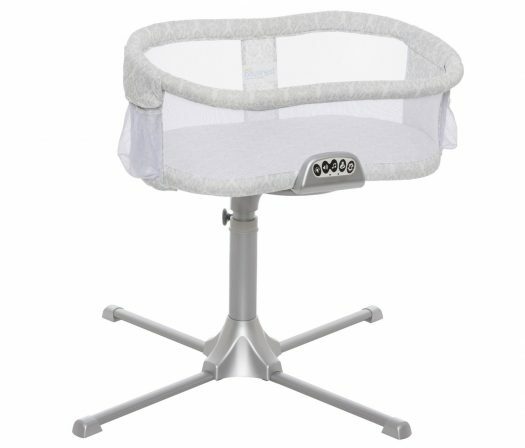 The closing straps are easy to handle but their positioning might not be very comfortable for every infant out there. The straps will not come undone on their own and they hold the diaper in place really well until you decide it is time to take it off. When it comes to disposal, these diapers close up perfectly and you can pack them away easily. They will not unfold in the process so you can take your time finding the trash bin if you are on the move which is very useful while traveling. The closing straps will remain sticky and you can readjust them when you want. When it comes to price, Pampers Swaddlers are somewhere in the middle. They are not as expensive as some other brands out there so these diapers can fit into anyone’s budget. But they are not super cheap, either. The price and the number of diapers in a single package depends on the size you are going for. For example, a box of size 1 (8-14 lbs) is available in a 216 count with a retail price of $53.99. That’s pretty amazing in terms of brand name disposable diapers. But it’s the fact that you’d be buying in bulk that gets you the savings. Pampers Swaddlers do offer a comfortable fit and the elastic material on the back, as well as on the sides will give your little one the complete freedom of movement. Therefore, they will be able to crawl and play without feeling restricted in any way. There shouldn’t be many leakages either, especially if you are close by and monitoring the situation. These diapers will look completely normal under clothes, even the larger sizes because they are just not too bulky. The absorbing part of the diaper is pretty thin which adds to the overall look and feel. The clothes will go over them easily since the outer surface is pretty soft. These diapers do come with a variety of cute designs and they are placed around the waist. The rest of the diaper is white and classic. So, they are not completely covered in patterns but still manage to look playful with this small detail. The decorative bands are colorful but there shouldn’t be any transfer to your baby’s clothes or skin. The majority of Pampers Swaddlers can hold the liquid for up to twelve hours. Of course, the infant sized versions will not be as powerful as the bigger diapers so have to change them more often if you want to keep your little one happy and content. Bigger diapers are definitely stronger and they will absorb the liquid quickly, providing your baby with dry skin almost immediately. The material is breathable which improves the overall comfort of these diapers. It is important to mention that if you go for a Swaddlers Sensitive option, the leak protection is not as good on that model and they are not capable of holding the liquid for the entire twelve hours. You might need to change the diapers more frequently even if you use a larger size which might not be suitable for every parent out there. They are still a great option if your baby is prone to rashes and redness because these diapers are excellent in terms of skin care. …these diapers can fit into anyone’s budget. Swaddlers might not be the best brand if you are looking for diapers made of natural ingredients. This brand still uses chemicals in their products even if the levels are very low. Therefore, Pampers is not a completely green brand which might be a bit off-putting to some of you. So if your baby is sensitive to PVC, latex, and so on, you should consider looking into the alternative options. The material itself is very soft and it does feel great on the skin. 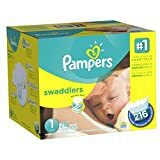 So, if you are not ready to experiment and try other available brands, Pampers Swaddlers is a solid option that will keep your baby dry for a longer period of time. The price itself is quite affordable, especially if you go for a larger pack and they can fit your budget easily.